The Type-9OOX l/P, E/P transducers are a series of compact electronic pressure regulators that convert an electrical signal (current or voltage) to a proportional pneumatic output. Utilizing internal solid-state feedback circuitry, the Type-9OOX provides precise, stable pressure outputs to final control elements. Immunity to the effects of vibration or mounting position, high tolerance to impure air, and low air consumption make this unit ideal for use in demanding applications. The heart of this unique technology is a bimorph piezo actuator that is encapsulated in a protective skin. This protective skin provides defense against the humidity and contaminants often found in process operating environments. 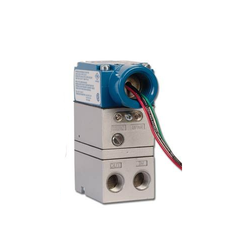 The Flucon 500 FC series transducers are ideally used to convert current or voltage input signal to a linearly proportional pneumatic output pressure. This versatile instrument is rugged and reliable force balance transducers for use in both process control and industrial applications, for standard process control applications which typically utilise 3 to 15 psig output and industrial & high pressure application which typically utilise pressure output up to 120 psig. 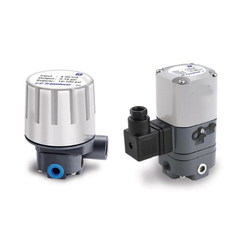 Flucon 500FC series transducers combines low cost, high accuracy and minimum air consumption with field proven technology. Versatile design features and rugged, compact housing with a choice of CMRI and ATEX* approved versions for explosion proof or intrinsically safe operation when used with a suitable barrier. Looking for I P converters ?